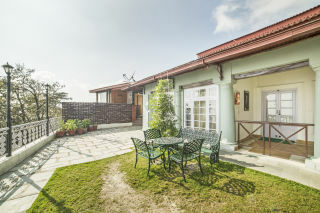 Located 3 km from Jama Masjid, this offering of a private room can accommodate up to three guests. 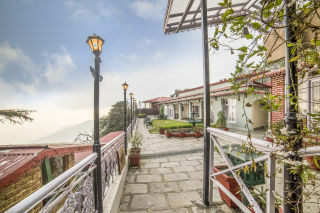 The pet-friendly villa is nestled in tranquil valleys. Breakfast is complimentary here. Parking is available for those on a road trip. Your Space Featuring a traditional-style built with a long airy veranda sitting before a decorative terrace garden and a panoramic view, this is a classic Victorian-style villa. 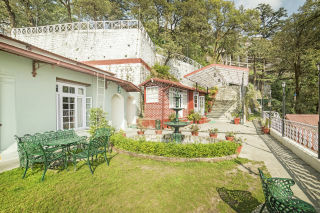 Wrought-iron chairs and tables adorn the lush lawns where you can unwind in the sun. 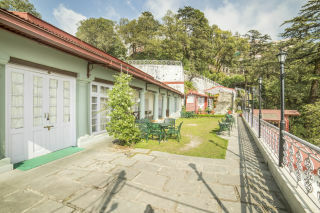 The veranda is lined with garden lampposts which add a nineteenth-century touch. Floored in rich mahogany-finish hardwood, the bedroom on offer is rather tastefully furnished with a cottage-style double bed, a cushy sofa set with a breakfast table, a standalone cabinet, and a vanity dresser. An exquisite Kashmiri runner rug adds a pretty contrast to the dark tone of the floors. For those with tiny tots in tow, a supplementary single bed is provided within the room. 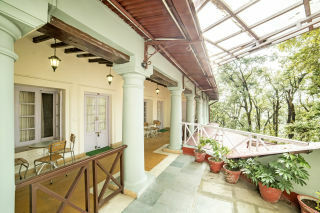 On the side, it opens out to a quaint balcony that accords an intimate view of the pristine deciduous woods and ensures a calm solitude. The bathroom is well-appointed with modern sanitary ware. 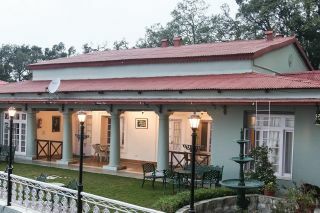 For grub, head over to the multi-cuisine restaurant, which has a peppy bistro ambience and a lovely view of the woods. Our property is located just a kilometre from the city centre. It is close to places like St Emilans Church (Approx. 1km) and Jama Masjid (Approx. 3km). 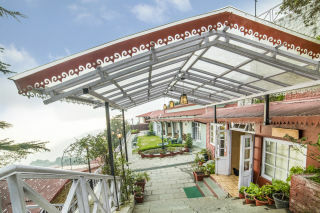 Guests can also visit Jwalaji Temple (Benog Hill), Jharipani Fall and Lake Mist.